Our success in bringing about meaningful encounters of the whale-kind in 2018 averaged over 95% for the Tall Ship and over 98% for the VIP Jet Boat during the season. The reality is that no one can ʻguaranteeʼ a whale sighting in the natural environment but we are proud of the high success rate for sightings in our area. 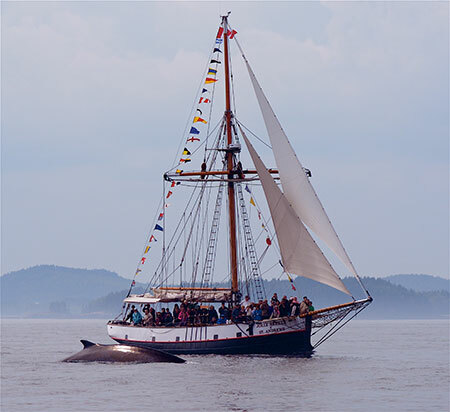 The Tall Ship ‘Jolly Breeze’ is an authentic and classic way to view our beautiful Bay of Fundy and is an added experience in addition to the whales and other wonderful wildlife of the area. The VIP Jet Boat ‘Jolly Hurricane’ whale watcher and scout boat also maximizes the wildlife and whale sightings. The VIP jet boat may go out further into more open waters, with weather and whales depending. By choosing to take a boat to see wildlife in it’s environment is testament to the fact that this is the way you prefer to see other species that co-exist upon the planet, the thrill you experience when a whale, porpoise, seal or bird pops up unexpectedly in it’s own environment far outweighs the sight of having seen one caged. It is the thrill of anticipation, without expectation, that makes the experience so richly rewarding. This is the treasure. We of the “Jolly Breeze” want you to feel that thrill, and so will do all within our power to show you as much marine life as we are able. We do not believe in a offering a monetary refund as we believe it was the treasure of seeing the natural beauty of our area and marine life in it’s natural habitat that was what you came aboard for and for the additional experience of being on a classic tall ship or exhilarating jet boat ride and all that those have to offer.